Of all the dinner/lunch pairings I’m sharing this month, this cauliflower wrap is my favorite. I’ve mentioned before how I love the combination of curry and cauliflower and this pizza is the best (in my book). I roast extra cauliflower for the pizza and save it to make a wrap/stuffed pita for lunch the next day. Add a little hummus (or even chickpeas) for protein and you’ve got yourself a meal. 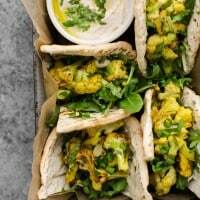 An easy wrap for work or a picnic, this cauliflower wrap gets flavor from curry powder and a bump in protein from hummus. Preheat oven to 400˚ F. Cut cauliflower florets into small, bite-sized pieces. 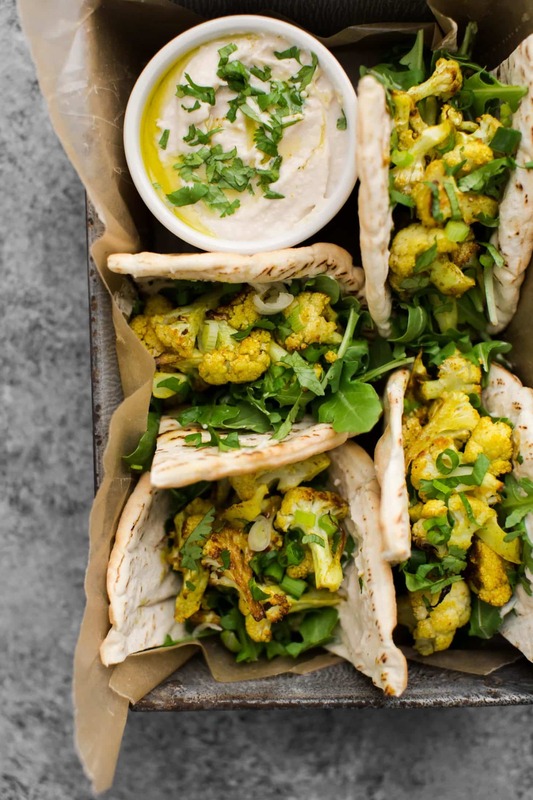 in a roasting pan or sheet tray covered with parchment paper, toss cauliflower with olive oil, curry powder, and salt. Bake until browning, 20 to 25 minutes. Meanwhile, spread hummus inside the wrap or pita bread. Toss greens with scallions and cilantro. In a small bowl, whisk together the olive oil and lemon juice. Pour over the arugula and toss until well coated. Divide the greens into the wrap/pita then once the cauliflower is done, divide on top of the greens. 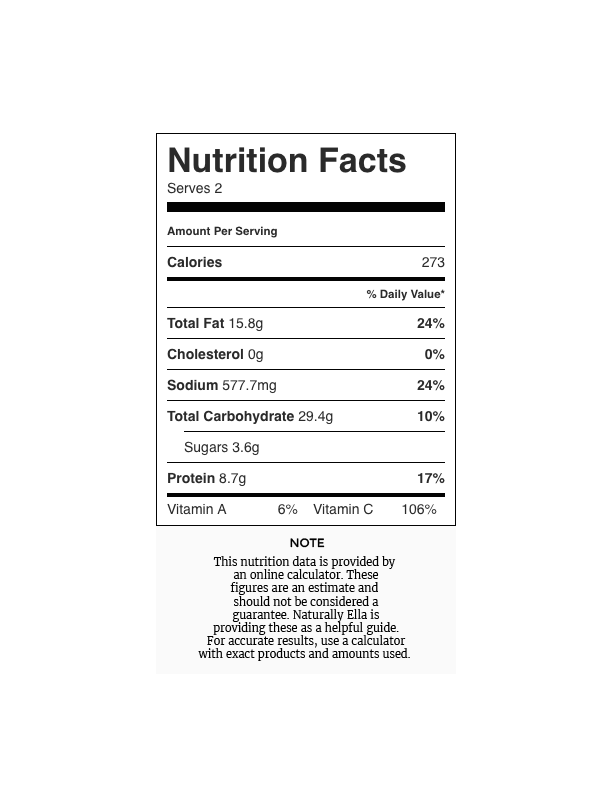 Tips and Tricks: if using a curry powder that has salt, omit this salt. Ditch the bread and add extra greens to make a salad. 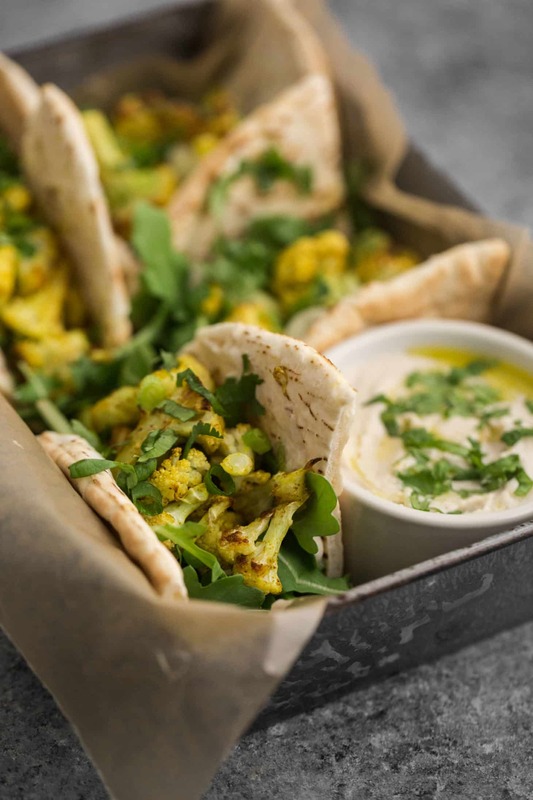 The curried cauliflower is great when paired with a lemon vinaigrette. What’s great about this recipe is that if you keep the curried cauliflower, everything else can be swapped out to meet your needs. Also, if you’re in the market to make your own curry powder, I really love this recipe. Or, I keep a bottle of this curry powder on hand for those times I don’t feel like blending my own. The Wrap: I love stuffed pita or a hearty whole-grain wrap but if you’re looking to keep this gluten-free, using lettuce is a good alternative (or try your hand at a grain-free wrap or buy gluten-free tortillas). Hummus: I try to always have hummus on hand for wraps like these but occasionally I don’t and I’m pinched for time. Chickpeas are a nice addition and sometimes I’ll roast them along with the cauliflower to provide a bit of crunch. If you’re into this curry/cauliflower combination, I have a few other recipes I think you would enjoy. The key is to make (or find) a curry powder you really like and go from there. And if you can’t get your hand on cauliflower, I still make these dishes with sweet potatoes. This really looks delicious. I can’t wait to try this recipe! Gimme gimme! This looks so good. These look awesome! I love curry and cauliflower together – such a delicious combination. I am wondering how this is at room temperature left over. I am doing a lot of substitute teaching so ove from school to school daily and like to take a lunch with me that I can keep with me instead of having to hunt down the teachers’ lounge and keep chilled using an ice pack. I actually think this would be great at room temperature- just make sure the cauliflower is cool before adding it on top of the greens! I ate it cold and it was superb! These look amazing! Thanks for sharing, Erin! Yes! 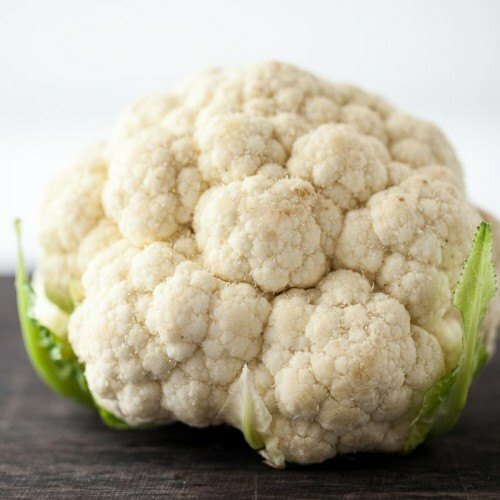 The cooking takes a bit longer since the veg has to thaw and the texture will be slightly different (it would be like you blanched fresh cauliflower then roasted) but it would work!